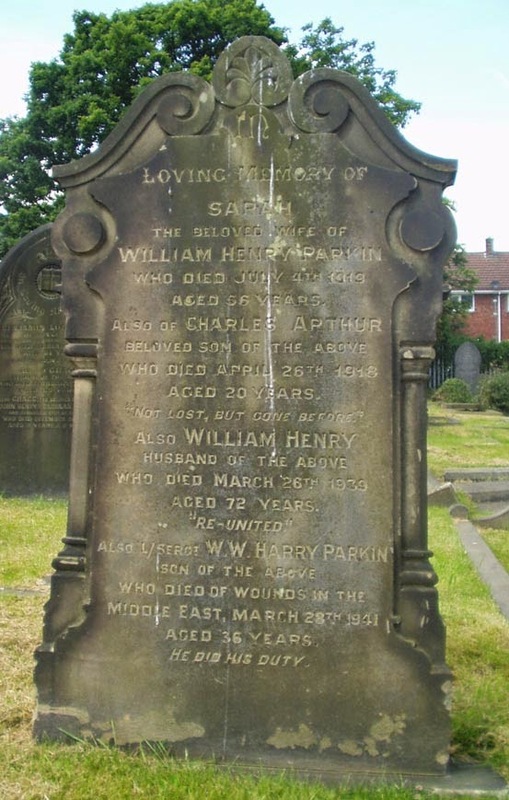 In Loving Memory of / Sarah / the beloved wife of / William Henry Parkin / who died July 4th 1919 / aged 66 years / also of Charles Arthur / beloved son of the above / who died April 26th 1918 / aged 20 years / "Not Lost, But Gone Before" / Also William Henry / husband of the above / who died March 26th 1939 / aged 72 years / "Re-United" / Also L/Sergt W.W. Harry Parkin / son of the above / who died of wounds in the / Middle East, March 28th 1941 / aged 36 years / He Did His Duty. Harry is also remembered on the Ardsley, Christ Church, Christ Church Parishioners - WW2 memorial tablet. William Henry (Harry) is buried in the Keren War Cemetery in Eritrea and commemorated on the Commonwealth War Graves Commission website.